WOMMACK COMMERCIAL CENTER. 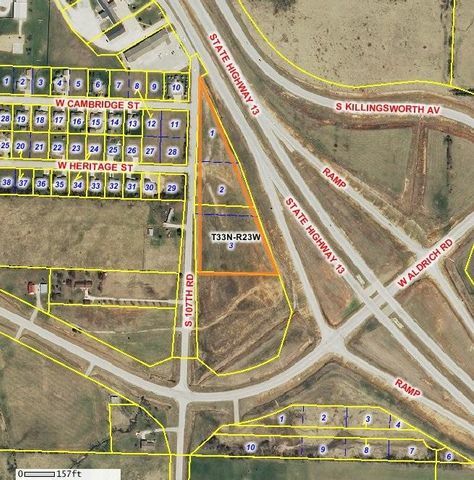 This listing is for Tract 3 of the Three commercial lots zoned C-2 in the City of Bolivar. Great site for variety of commercial businesses. Property abuts Hwy 13 with 4 way on/off for easy access to North/South Hwy 13 traffic. Excellent marketing window to nearly 12,000 vehicles daily on Hwy 13. Adjacent to Super 8 Motel, Tractor Supply and other commercial uses.. Water, sewer and electrical avail. Seller motivated to Sell. Call for individual lot pricing. Lot 1- 1.1 ac, Lot 2 - 1.74 ac.See MLS 60129243 for bulk sale price of of all three parcels. Please provide more information about Listing # 60129246.